I suspect my reader base that isn’t fond of birds feel like they are getting a root canal when they come here as of late. To those individuals I must extend my upmost apologies. I will do my best to make up for this lean to the feather, but I am on a mission and I’m running out of time. Funny how a couple of months before the finish line seem like an eternity until that calendar turns and you’re left looking at your to-do list wondering how it could possibly still have that many items. There are definite upsides to all this focus on production – my photo queue, although still rather slight, has been shrinking. It did undergo a transformation from FIFO popping to LIFO popping meaning the memory banks will need to be excavated as the snap to post gap on some of those queued items are getting pretty long (3+ years yikes). The other benefit is I get to show off a number of cool birds! This bird is so cool it got the Linda stamp of approval. She doesn’t pull this particular stamp out very often. Contrast that with her “Total Crap” stamp which is so worn down from overuse you can barely read the words – she’s a pretty harsh critic of my work hehehe. When it comes to bird photography, she will not even give the subject the dignity of taking a picture if it isn’t “pretty”. Needless to say, Sparrows will never occupy her tin. It didn’t take her long to get her camera out and start taking pictures of this gorgeous specimen. Hit the jump to see a few more pictures of this striking bird! Noted previously, we were visiting Laguna Atascosa National Wildlife Refuge on New Year’s Day 2017. Already feeling lucky having chosen to experience the refuge on a “free day”, we walked out of the visitor center doors to a racket of calling birds. We located the source of the noise just of the trail to our left. 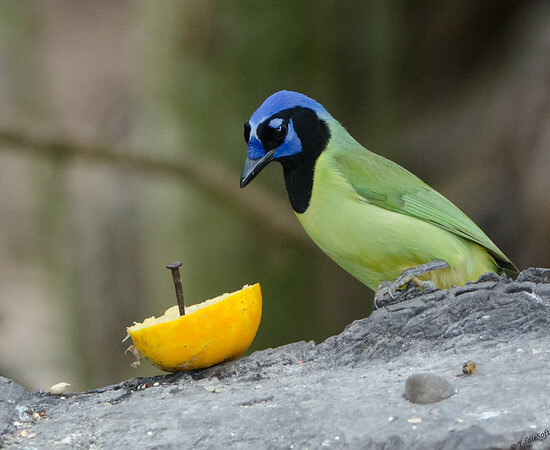 There we found a party of brilliantly colored green, blue, black and touches of yellow birds. I immediately recognized this from the field books I was reading on our way to the Gulf Coast. From all the birds supposedly in this region, this is the one that I wanted to bring back, the one that would make the trip worthwhile if this was the only bird we encountered the whole trip. Note, there is always a target bird for all our trips – like the Painted Bunting on our Georgia trip! Up to that point, there had been zero sightings of this bird. My disparaging words about the accuracy of the reference books had to be eaten now that there were 10 to 15 before me – battling the Great-Tailed Grackles for most obnoxious call. It didn’t take Linda very long before she was snapping right alongside me – this bird clearly met her interest conditions. Later that night she even made a point to post it on her Facebook page. Sure, I could make my posts the day of, but a famous photographer once said “a fine bird must be aged appropriately like a prized wine” Don’t ask me who said that, I just made that up to make myself feel better. That loud thud you just heard is from Linda’s Total Crap stamp on that lie (told you she is a harsh critic). 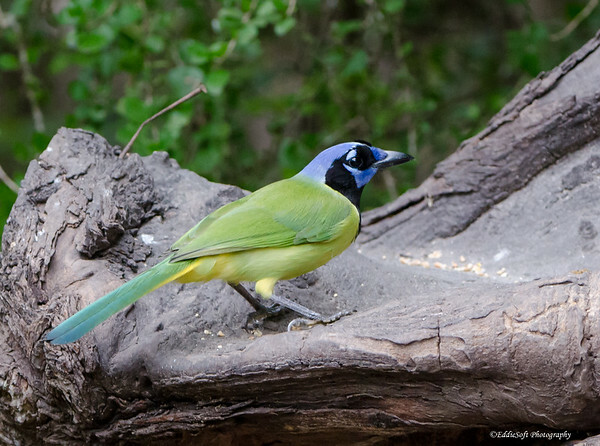 So, this bird is called a Green Jay. 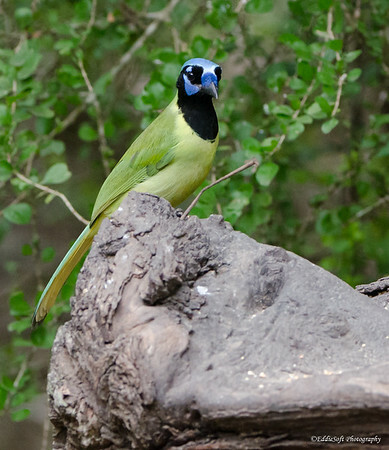 The Green is a tropical bird that prefers to spend its time in Mexico and South America. The reference books noted they will move up into the southern tip of Texas. 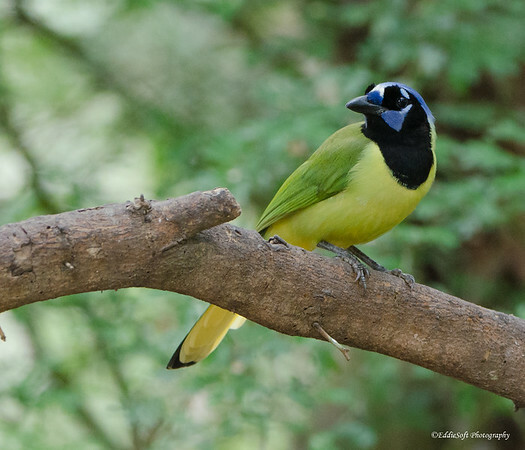 Ron continues to argue that I cannot add these birds to my North American birding list under the argument they are really Central/South American birds that are just tourists to the US. This, of course, a desperate attempt to prevent me from closing the gap between our counts. These protests were quickly dismissed (along with my counter-argument that called into question his Common Ground Dove ha). 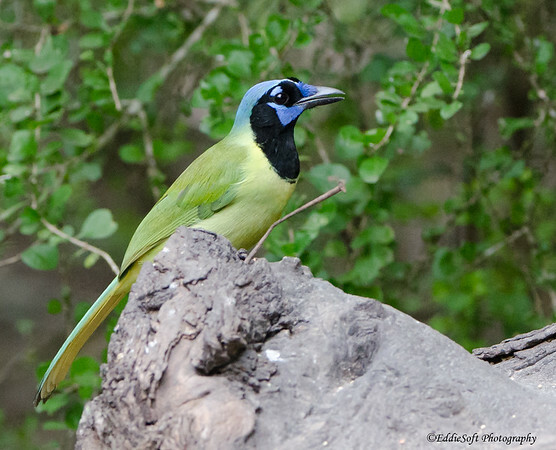 This ended up being our only sighting of the Green Jay on that trip. 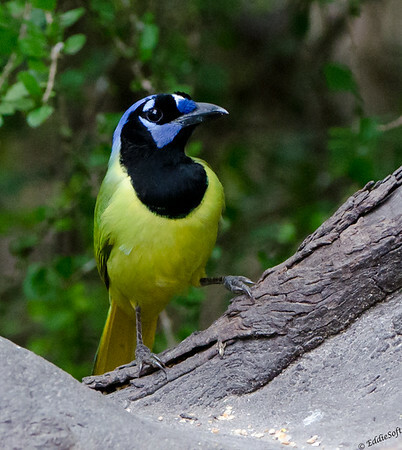 On our recent trip we encountered a number of them hanging out at wildlife refuges along the Rio Grande. I hope to get to the spoils of that recent trip sometime soon (dreading getting back into that darkroom with the thousands of shots from that trip). Every time we encountered these birds it was amazing how tolerant they were of us. Linda and I probably spent well over 45 minutes snapping away as they went about their business gathering up seeds from nearby feeders and enjoying the sweet juices of oranges put out by the staff. I tend to leave out the food shots, but really liked the overall color pallet – greens, blue, blacks and then the added orange coloring. Also amazed on how neat these birds keep themselves. Almost expected them to be wearing little white gloves and a top hat. 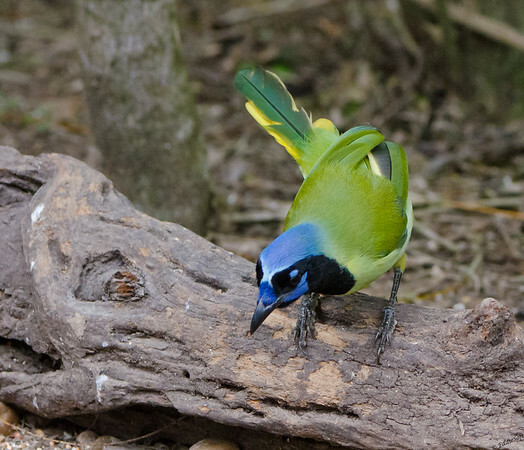 I went with more pictures for today’s post because there wasn’t much in the cool facts arena to pass on for this bird. Cornell’s revamped website was pretty sparse on intriguing nuggets beyond the farther South American varieties have a slightly different color pattern. They are more yellow hued on the breast and undertail and deeper green on the wings. The Cornell reference pictures also showed a bit more white mixed into the back of the head – not sure if this is standard or it was in a transition – Google image colorations were all over the place. Going to call it a post folks. Hope you enjoyed my look at the Green [with envy] Jay. 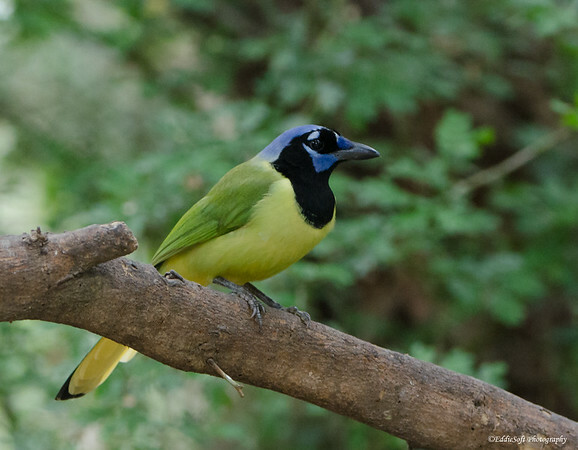 I’m jealous that we can’t experience these gorgeous birds in our parts – unfortunately, we got stuck with the much more boring Blue one. By the way, our visit to Laguna was so productive I went back to the visitor center and donated their normal entry fee – always good to be able to give back! What a strange looking beautiful bird. Your shots are really super at capturing the colors and the contrast with the orange is great. Tell Linda to get out her total crap stamp again now that I puffed you up with complements. LOL. Really nice work! Thank you – definitely a bird where the pictures don’t always do it justice compared to seeing it in person.